During the Kite Festival in Ahmedabad it is normal for each person to use 200-400 kites a day - That's a lot of running around! 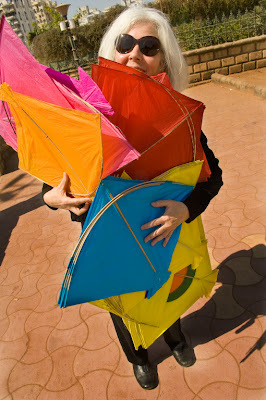 Here in Ahmedabad, northern India, the annual kite flying festival has just ended. As in the book The Kite Runner, everybody in town participates in the competition. I was thrilled to experience first hand (ouch) that the string really is coated with very fine sharp ground glass to aid in cutting the opponent’s kite from the sky. 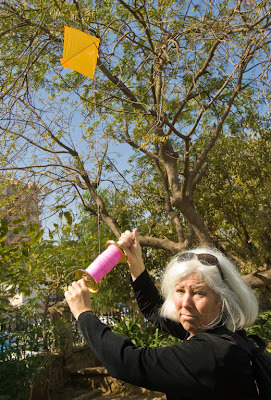 We wanted a kite to use as a prop in one of our India lifestyle shots. We ended up with 20, which we were told is the minimum number you can buy at a time. My first attempt at kite flying was not very successful. 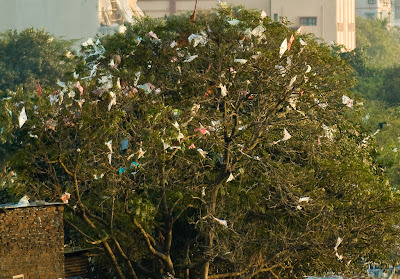 Even 2 weeks after the Kite Festival, wayward kites hung like multicolor fruit from every tree in town.